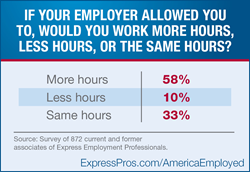 Express Employment Professionals released new survey results today revealing workers’ desire to put in more hours on the job. Americans recognize that putting extra effort can be the key to getting ahead, getting a raise or getting a promotion. “Workers’ hours have become a hot topic lately for a number of reasons, including federal regulations and political campaign rhetoric,” said Bob Funk, CEO of Express and a former chairman of the Federal Reserve Bank of Kansas City. “Our survey makes it pretty clear: workers want more hours. Only a few wish they were working less. The survey of 872 workers was conducted in July 2015. The respondents are current and former associates of Express Employment Professionals. If you would like to arrange for an interview with Bob Funk to discuss this topic, please contact Sherry Kast at (405) 717-5966. Robert A. “Bob” Funk is chairman and chief executive officer of Express Employment Professionals. Headquartered in Oklahoma City, the international staffing company has franchises in the U.S., Canada and South Africa. Under his leadership, Express has put more than five million people to work worldwide. Funk served as the Chairman of the Federal Reserve Bank of Kansas City and was also the Chairman of the Conference of Chairmen of the Federal Reserve. Express Employment Professionals puts people to work. It generated $2.85 billion in sales and employed more than 456,000 people in 2014. Its long-term goal is to put a million people to work annually. For more information, visit ExpressPros.com.